Weekend before last was the first one, apparently. Four days later, we get another. Fun stuff, this North. 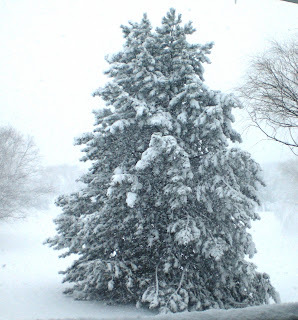 With at least a foot of snow on the ground already (probably closer to 15-16" or so), we get pounded with a true-blue blizzard. It came down HARD for pretty much a whole day, maybe a bit longer. The highways were closed. A State of Emergency was issued. Whiteout conditions were apparent. We enjoyed our leftovers from Snow Day (along with a frozen pizza), caught up on some movies and television, and had a great time. 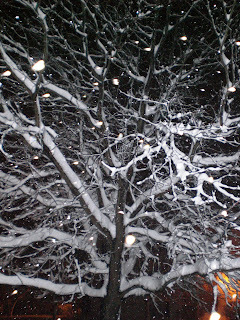 We went outside several times when it was only lightly snowing and there wasn't much wind. It was so exciting to walk around in the peace and quiet. 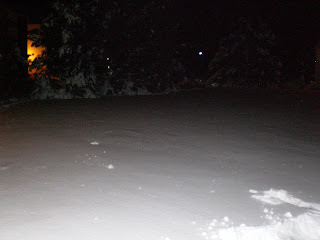 We trudged around the apartment complex and in the backyard. We checked the mail on the second night (yep, it really keeps coming!) around midnight and ran into several other people out and about. We witnessed the Bobcat plowing away. It was to my knees or above EVERYWHERE, sometimes a little higher. 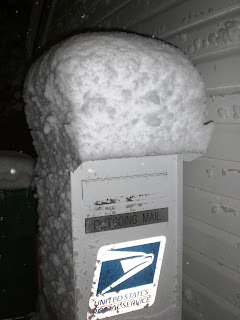 Here's a photo of the snow on our mail outbox, and another of me sitting on a plow-created snowbank. It's hard to tell, but my feet are dangling there, not on the ground. Some cars were much worse. We're really getting the hang of driving in "winter weather" conditions now, too. 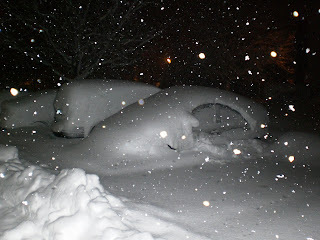 Our area has previously been very fortunate in that the roads are always well-plowed and salted. This time that wasn't the case. Some roads were fine, but others were slushy and icy (and I am talking semi-big roads... like Cashmere, Tharpe, or Dairy, to give some of our readers reference points). There was even leftover snow on some of the traffic lights! Jonathan was able to work from home for two days (the storm was bad enough that they actually closed his work's campus on Wednesday, and apparently they never do that! 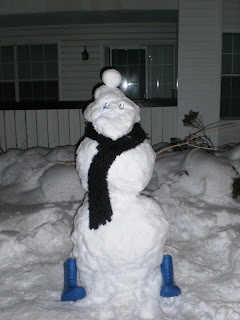 ), and after he finished up on Thursday we went outside with the intention of building a snowman. Our other snows up to this point were too powdery to build with, so I was excited about how packed this snow was. 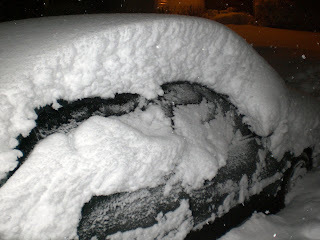 Problem was, however, that there was a layer of ice on top of the snow, an inch or two thick. This meant you couldn't roll a ball and get it bigger that way. 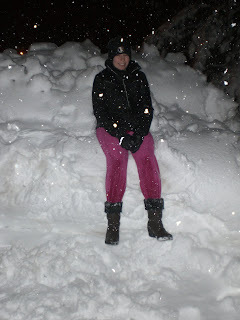 So we had to pack them by hand, which took much longer (over an hour), but we were warm and dry in our ski clothes, hehe. In the end, the head was misshapen... so we decided it would be a Snowduck instead. We carved out a beak, and Jonathan let him borrow a pair of boots. 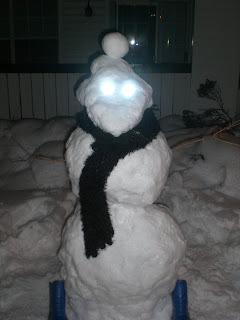 I loaned him a scarf, and we used miniature flashlights for the eyes. His name is Ervin Honker. 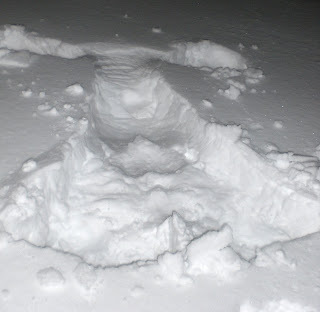 I tried to make a snow angel, but the snow was too stiff to move, so it turned out looking funky. 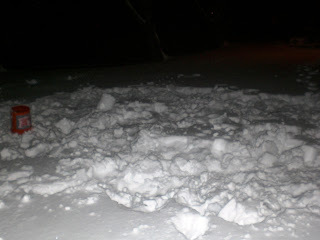 Below that you can see the smooth snow, and then what became of the area we played in, LoL.